Helping smart people become smarter for over a decade. 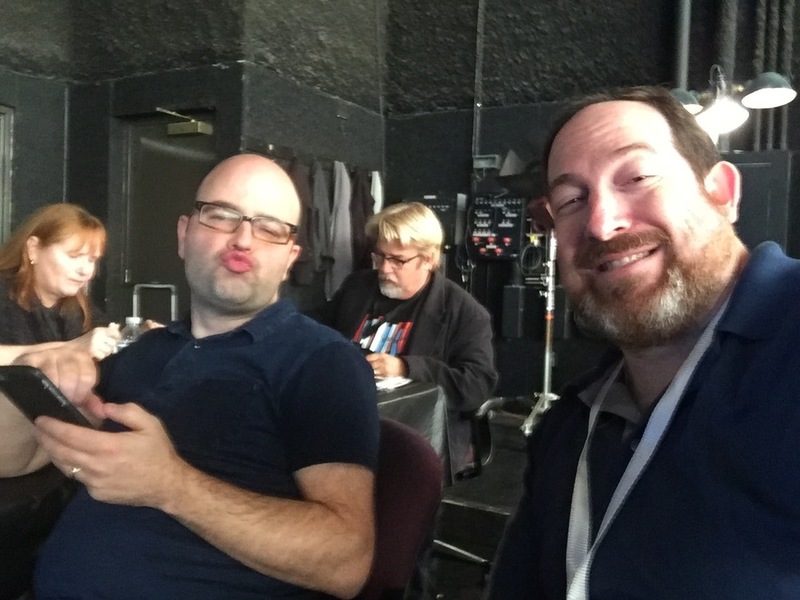 I got the chance to go speak at PostaPalooza 2015 thanks to longtime friend Jem Scoenfeld of the C47 fame. Here are the sessions I spoke at, in order. By the way - I had some of the nicest conversations with the attendees. Really made it part of the experience for me! NAB is loads of fun, but loads of work. Just a couple of pictures from my iPhone. If you'd like the sessions notes - here they are. And yes, you're allowed to email me and ask followup questions! I'm a big believer in EQing nearly everything; Speakers (goodbye everything under 80hz, as well as a rolloff above 3k), Music (reverse that - take out where speakers ranges are in the music), etc. And in Avid, the EQs are real time. I tend to use the same ones over and over and over again. Sure, I could save them in a bin. But why not save them in Avid's own EQ bin - making future reuse faster/easier. Open the following "bin" called Site_Effects (from the location below) and drag your EQ into it - for access as a preset built into the Avid tool. An Optional/Alternative way to add a track in Avid. Ever have titles on V2 or V3 and be forced to move them up because you need to add another element? If you hold down the Option/Alt key before you add a track...your system will ask you where you want that track, rather than just adding it above where you are. One warning - don't add a track at V25/A25; the system will think you've run out of tracks! 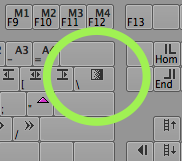 This tip is not about mapping your keyboard...nor that you can map elements with the shift key held down. Rather, this tip is based on the idea that you should only bind keys that make sense. I've taught bunches of people how to use Media Composer. When I walk into a facility I chuckle if someone has a sticker above the F Keys. Why? Because they had to write down what the key does, because it doesn't make sense. Anything mapped should have a logical connection to it's function, another key's function or the way you work. Right now, go look at your keyboard. Where is the Remove Effect button? Don't tell me it's on an F key. My Remove Effect is underneath the Quick Transition button. Why? Because it's the only button on the keyboard that creates an effect. The Shifted version of it removes an effect. The tip is really this: map your keyboard in a purposeful way. Some other quick suggestions: Set Expert Render to Shift-R - because, frankly, we still think of it as rendering. Put the Segment modes (yellow/red arrows) underneath the Splice in/Overwrite because they share similar colors. There's nothing worse in an Avid than importing music, forgetting to adjust it's gain downward...and hitting play, only to be deafened by the music. The Import Dialog box has a TAB marked audio. Adjust the "Apply attenuation" gain during import. All your imported audio will now be gained downwards by -20db - meaning, no more music pain! Avid tips like this will be in sessions at NAB/Post Production World! Come join us! One of the unique/cool things about Media Composer is that you can colorize tracks. Not useful during an online edit (I prefer neutrals while I color correct.) but killer in the 'story' mode of editing. Which timeline is easier to read? The one on the Left or the Right? Who can visually read this? The problem is this: the Avid Palette for the last five years only shows pastel colors. Holding down the opt/alt key before you to go to the track palette opens up the full system colors - giving you every color you might want/need. I find that many Avid editors have great tools under their fingertips - they just don't know they exist - and far more likely, they're confused about some of the capabilities. In this case it's the BCC Plugins. They're fantastic- and solve quite a number of limitations of the Avid compositing model, especially with titles, mattes and multilayer effects. So here's a webinar I did for Moviola/Boris. And it's Free. There's zero sales going on. No 'demo' either. Compressed teaching. Here's the link from Moviola's site. Moviola wants you to know about their other webinars. Last, here's the link to the presentation - I think both groups have it as part of their downloads, but just in case, I'm putting it here as well. And me? Yes, if you want to hire me to come out and teach you and your group BCC directly (or anything else, let me know here. ...and then find a dozen or so things to make each person in the room cry. But there're no notes from sessions like this because it's so custom. If you have a question about something I did during the session, feel free to ask me in the comments or email me. Color correction is a deep art at the end of the Post Production Chain. In this class, we focused on getting everyone capable of reading scopes, using the auto corrects, but most important, understanding the order of control use and the why behind it. This is the Symphony Color Correction window. Boris Continuum Complete are installed on nearly every pre version 6 Avid. These effects came bundled with the tools. Except most people don't know them and don't know the little tricks to get them to solve all sorts of problems in Media Composers compositing model - for example, you don't alt drag a boris effect onto a title. Of course, I couldn't cover all the effects, but I did cover how to decode the effects and get new and current users over a number of little stumbling blocks. PDF of notes from the session. Sorenson Squeeze comes with your Avid. It's crucial that you understand how to get your materials from your Avid (beyond just the send to template). We also discussed the basics of compression, how to get better looking YouTube videos, the CUDA acceleration in Squeeze and 360 Sorenson where you can host some content for free. These two technologies from Avid have ruined me as an editor. Once you use them, you'll never want to try editorial any other way. Michael Kammes. Damn is he a smart guy. First Session at the LA Post Conference. Had a great time with Michael Kammes of Keycode Media. Seriously, go check out his Web site for all sorts of fantastic technical knowledge. Here is the PDF of the keynote presentation we showed. Please plan your workflow. Please? I've just come across a friend who is dealing with a workflow problem. The problem is that he switched from one NLE to another...and things don't work the same. But why, why not first, contact the NLE manufacturer or resller and say "How to best do this?" Get the download demo, walk thorugh head to tales what your workflow plans to be.